Badam Phirni is a rich rice pudding just like kheer but more creamier and thick and smooth full of goodness of badam. Badam Phirni is lip smacking and and a royal treat for the taste buds. Soaked and grinded Basmati rice is added to the milk and cooked on low flame stirring continuously until it thickens. This cardamom flavoured and badam rich phirni is a sure heart winner. When served chilled and garnished with chopped badam relishing it is a completely divine experience. 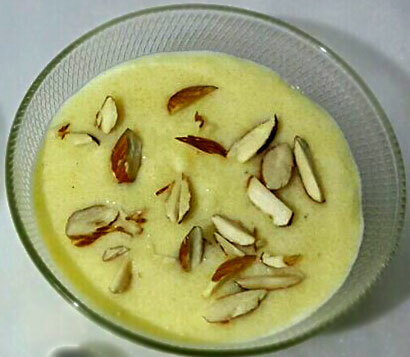 Learn how to make easy badam phirni or Indian almond pudding. Wash the rice and soak in water for 1 hour. Drain and grind it to a fine paste. Keep it aside. Soak the saffron strands in 1 tblsp of warm milk and keep aside. Heat milk in a heavy bottom kadai or pan. When the milk boils, lower the flame and add the rice paste and stir constantly to ensure it gets properly mixed in the milk and no lumps are formed. Let the milk simmer till the rice gets cooked. Now add the sugar, almond paste, cardamom powder and the saffron milk. Mix well and cook till the phirni thickens and sugar gets fully disssolved. Garnish the badam phirni with chopped almonds and chill the phirni for 3 - 4 hours before serving.